From When Kansas Was Young, pages 89 – 92. It was in the last days of March, 1879, when I reached Medicine Lodge after a long, windy and wearisome trip from Wichita in a freight wagon. I had not been notified that there had been a change of ownership in the frontier newspaper, and I may say in passing that when I started west I had no idea that I was to be a newspaper man. In fact I had never up to that time been inside a newspaper office or seen a type. When I entered the Cresset office on that windy March day, Iliff was seated at a pine table. In front of him lay his “45” revolver, fully loaded. He filled my imagination of what “Jim Bludso” of the “Arizona Kicker” ought to look like. His hair, black and coarse as that of an Indian, fell down over his collar. His eyes, black and flashing, looked out from under beetling brows with hairs stiff and wiry and as long as the ordinary mustache. His dress was in keeping with his appearance. Around his neck was a red bandana handkerchief. His dark gray woolen shirt, flaring open slightly at the throat, revealed in part the muscular neck and hirsute breast. He wore the leather “chaps” common to the cow men of that day and his pants, stuffed in his boots, were held in place by a belt well filled with loaded cartridges. A woven rawhide quirt hung from his left wrist. The heels of his boots were ornamented with savage-looking spurs. He was booted and spurred and ready to ride. But he was not just then thinking of the range. He was engaged in writing a most vigorous editorial, as I recall, on the Hillman case. A couple of weeks before that time there had been a tragedy up on Spring Creek, fourteen miles northwest of Medicine Lodge, and a country justice, George Washington Paddock, acting as coroner, had held inquest over the supposedly dead body of John W. Hillman. Hillman, a farm laborer of Douglas County, had, at the instance of one Levy Baldwin, taken out life insurance in various companies to the extent of $25,000 in the aggregate. No cash had been paid, as I now recall, for the initial premiums on the policies. Notes, I think, indorsed by Levy Baldwin had been accepted by the agents. That a man in Hillman’s financial circumstances should take out so much insurance on his life, was to say the least, remarkable, for in those days the farm laborer was not paid large wages and the annual premiums on that amount of insurance would equal the probable earnings of a man like Hillman. A man by the name of Brown reported the killing of Hillman. He said that in drawing a gun out of the wagon it was accidentally discharged, the bullet striking Hillman behind the ear and passing through his brain. The verdict of the coroner’s jury was based on these supposed facts. The body was buried at Medicine Lodge. I think his wife did not come to the funeral, an indifference displayed on the part of his relatives and friends. Ten days afterward a representative of one of the insurance companies arrived at Medicine Lodge and had the body exhumed and shipped to Lawrence for identification. Then commenced one of the most celebrated cases in the history of life insurance. The claim of the insurance companies was that the whole thing was a conspiracy concocted by Baldwin and Hillman to defraud the insurance companies out of $25,000. They declared that a victim by the name of Walters had been employed by Baldwin and Hillman to accompany Hillman and Brown down to Barber County, where Walters was to be murdered and his body buried for that of Hillman, while Hillman, of course, was to disappear. Some months after the killing Brown made a confession, in which he declared that his first statement to the coroner’s jury was false; that, as a matter of fact, Walters had been murdered by Hillman at the camp, after which Hillman had disappeared and Walters’ body had been buried in his place. The attorneys for Mrs. Hillman produced several reputable witnesses in Medicine Lodge, who declared that Hillman had visited the Lodge several weeks before the killing, and was detained there during a storm which lasted several days. 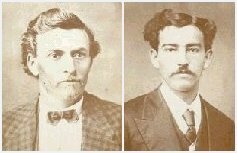 These witnesses declared that the man who visited the Lodge on the prior occasion and the man who was shot were one and the same. Knowing these men well, I can not doubt their honesty, and it is hard to believe that they were mistaken. Pictures of the missing man, Walters, and of Hillman did not show any marked resemblance between the two. On the other hand, the circumstances were exceedingly suspicious, the taking out of a $25,000 life insurance by a common laborer, the burial of the body in an unmarked grave, with apparently no intention of removing it to his home at Lawrence, the giving of notes instead of cash for the payment of the first premiums on the policies, the confession of Brown, all tended to make a strong prima facie case for the insurance companies. For a quarter of a century the case dragged its way through the courts, up to the supreme court of the United States and back again and again to the supreme court. Some of the ablest lawyers not only of Kansas, but of other states were engaged on one side or the other. Finally the case got into state politics, when Webb McNall, insurance commissioner under Governor Leedy, ordered the New York Life to pay the Hillman policy or get out of the state. The cases were finally compromised, the companies concluding that it was better to pay what they considered a wrongful claim than to fight the matter longer. If Hillman was not killed, he was never heard from again; if the man who was killed was not Walters then there was another remarkable disappearance. I have little doubt that taking out the policies of insurance was part of a conspiracy to defraud the insurance companies, but I have thought there was a failure of the plan, at least so far as Hillman was concerned, and that he was really killed at the lonesome camp on Spring Creek. This story by T.A. McNeal was originally published online at the Barber County, Kansas: History & Genealogy web site by Jerry Ferrin on 13 July 2007.